The temperature and texture of the soup determines the bowls’ shape. Thick, chunk-filled soups, like a hardy beef soup, retain heat and are served in shallow, wide bowls – which releases heat well. If soup has a smooth texture (pureed soup) it is served in a deep bowl – which hold heat well. Narrow cups are used to serve clear soup because they preserve temperature well. 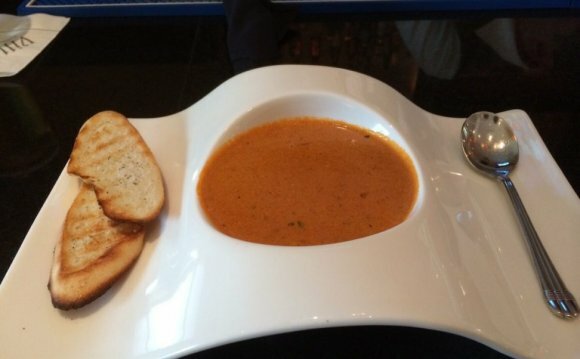 The shape of soup bowl/soup cup handles help determine the bowl’s use at the table. Vertical open-loop handles (cream soup bowl or bouillon cup) can be lifted and the liquid is drunk. Solid horizontal handles (lug soup bowl) can be tilted to gather the last bit of liquid. Soup bowls hold 8–12 ounces on average. Soup cups hold approximately 4 ounces. Underplates help protect the table from heat and balance the place setting. All bowls, even ones with saucers, should be placed on an underplate. Wide, shallow bowl with a flanged rim. Diameter is approximately 9 to 10 inches, the rim is 1 to 2 inches wide, the depth is up to 1 ½ inches deep, and the well is 6 to 7 inches across. The only soup bowl used in formal dinner service. Saucer-like shape approximately 6 to 9 inches across. Only for informal dining. With or without a rim. To serve food eaten with a fork (salad or pasta) or eaten with a spoon soup. Used only at informal meals. Slightly narrower and deeper than the soup plate and coupe soup bowl. Keeps soup hot from kitchen to table. Table etiquette requires that guests remove the lid, rest the cover, rim side down, on the side of the underplate, and replace it before the table is cleared. 4 ½ to 6 ½ inches across, and the depth is approximately 2 to 3½ inches.